Since 2014, the Berliner Antikensammlung has showed its newly conceived Greek art exhibition on the main floor of the Altes Museum. The exhibition features a room dedicated entirely to Greek coins and presenting, via a special exhibition display case, a Topoi project on numismatics: C-II Images / Topoi 1. Greek coinage plays a special role in Antiquity beside their meaning as currency: they display the reproduction of spaces and places. The project display case introduces visitors to a unique phenomenon in Greek coinage: the reproduction of spaces and places. Interestingly enough, in antiquity many imaginary spatial structures came to achieve greater fame than actually existing spaces. The most famous example is surely the labyrinth of the Cretan city of Knossos, which is inextricably linked with the legend of the Minotaur, Theseus and Ariadne. 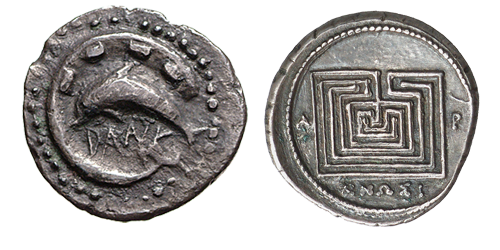 The labyrinth was employed on Knossian coins in the most diverse ways as a fictitious emblem of the city. By contrast, the Sicilian city of Zankle illustrated its coins with its actually existing, eponymous harbour, which has a characteristic sickle shape. Like the labyrinth, the harbour was depicted in a manner unusual for other art forms, but typical for coins, i.e. a bird’s-eye view. Coins from various Greek cities feature depictions of everyday places, such as scenes occurring in a temple, a well house, or a racetrack. These few examples alone suffice to make it clear that Greek coins, with their broad geographical distribution and rapid chronological succession, afford an excellent opportunity presented by hardly any other art form to conduct an image-based scientific analysis of the depiction of space and spatiality in antiquity.